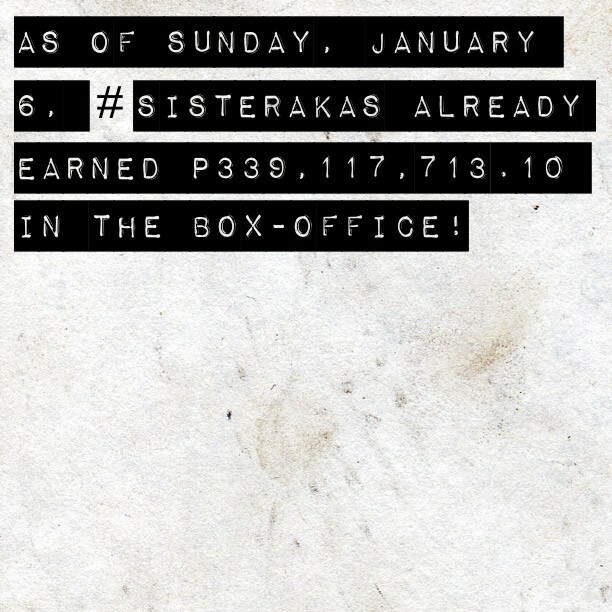 MMFF 2012 top grosser 'Sisterakas' continues to break records and is now officially the all-time highest grossing Pinoy film after 13 days of showing. As of 13th day of the 38th Metro Manila Film Festival (January 6, 2013), 'Sisterakas' has already earned P339.12-million, according to the box office report shared on Twitter this morning by the very hardworking ABS-CBN ad prom head Eric John Salut (@ericjohnsalut). So far, these 2 films are the only local films which crossed the P300-million mark and for the upcoming films to beat their records, they should aim for the P400-million mark. Also contributing big to 'Sisterakas' record-breaking success is of course the proven box office prowess of its 2 female leads Kris Aquino and Ai-Ai delas Alas. And of course, the KathNiel loveteam (Kathryn Bernardo and Daniel Padilla) played a big part as well. Philippines' Hottest Men: They're down to 20! Bench Summer 2013 Ad Campaign Photos out! American Idol 2013 Spoilers: Top 40 Results leak!